The raid coincided with the release of UN figures showing Afghan civilian deaths in the first 10 months of the year were running 11 per cent higher than in the same period last year. A preliminary United Nations investigation has found that eight students were among 10 Afghan civilians killed in Kunar province on Sunday. 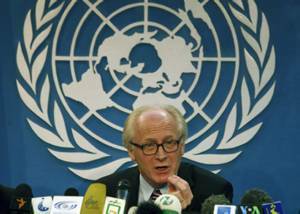 A statement Thursday by Kai Eide, special UN representative, says the deaths occurred during a raid by Afghan and international military forces in the province's Narang district. "Based on our initial investigation, eight of those killed were students enrolled in local schools," Eide said. 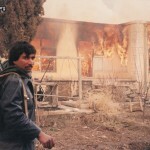 "There is also evidence to strongly indicate that there were insurgents in the area at the time." At the same time, Eide said, many details of the incident remained unclear. The incident outraged President Hamid Karzai, and prompted demonstrations against the international coalition in several cities across Afghanistan. Afghanistan's government on Thursday also demanded that those responsible for the deaths of "innocent youths" be turned over to its custody. NATO has denied its forces were involved, suggesting "non-military Americans" had returned fire in self-defence. The UN statement also expressed the hope that both the Afghan government and international military would do what they could to get to the bottom of the incident. More than 2,000 Afghan civilians died between January and October, most at the hands of the insurgency. 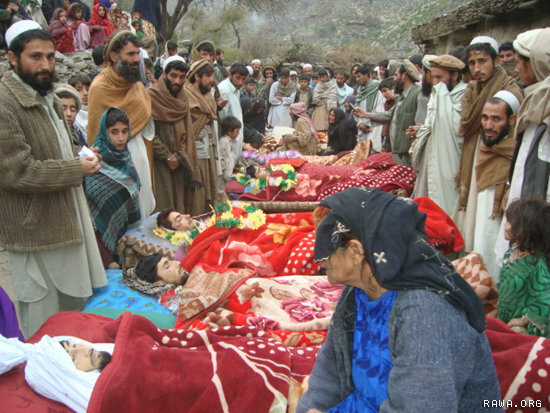 However, more than 400 were killed as a result of the operations by the U.S.-led international military coalition. "The United Nations remains concerned about night-time raids given that they often result in lethal outcomes for civilians, the dangerous confusion that frequently arises when a family compound is invaded, and the frustration of local authorities when operations are not co-ordinated with them," he said. "Night time raids are a source of great distress to the families which are directly affected as well as communities throughout Afghanistan given safety and cultural concerns." Still, the figures showed a sharp drop in the proportion of civilians killed by NATO forces, which the UN attributed to a decline in the use of airstrikes. Civilian deaths have been a major sore point among Afghans, and U.S. commander, Gen. Stanley McChrystal, has urged all coalition forces to do their utmost to minimize such casualties. Separately, Thursday, police said Taliban insurgents had beheaded six people for co-operating with the government in Uruzgan province. A seventh Afghan was being treated for serious injuries. UNICEF has estimated that at least 30% of Afghan children age 5-14 are working in some form.